Hrafnar is a very exciting young stallion prospect. His parents are two of the worlds best tölters. This young boy is black with a star, with a beautiful neck, well raised and sloaping winthers. He has a soft overline, high legs and a pretty head. 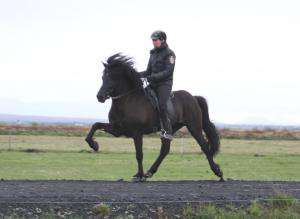 When a young foal, just a few days and weeks old, his main gaits were pace and tölt. 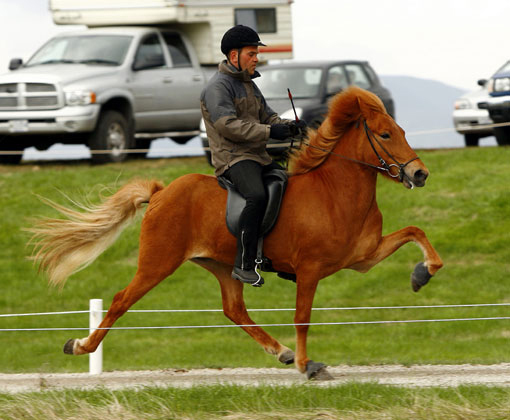 Now when a little older his favorite gait is trot – with wide steps and high front leg movements. Hátíð frá Úlfsstöðum, knapi Erlingur Erlingsson.